In the last couple of articles on Zanskar valley, I provided a detailed description of how you can travel from Kargil to Padum; and tourist places that you must visit en route. Continuing next in Zanskar series, in this post I will talk about the total cost of Zanskar valley trip that you will end up incurring; including details on expenses for accommodation, meals and transport. Planning budget or calculating cost of a trip is not really an exact science because there are way too many variables. It will heavily depend on an individual’s personal spending habits; mode of transport and duration of the trip. So while I write this article, I am really talking more in terms of “minimum cost” rather than an “exact cost”. By the end of this article, you will have a fair idea on how costly things are in Zanskar valley; and what your per day minimum expense will be. Adding it to your personal expenses will give you a close enough (if not exact) idea of how much a Zanskar valley trip will cost. The calculation below can be used to calculate the additional expense of adding Zanskar to your Ladakh trip; or the total expense for visiting Zanskar only. If, after reading the article, you have any other questions, you may ask in comments section towards the bottom of this page. When it comes to Zanskar Valley, one of the most common questions I get asked is if it is worth visiting at all. Thousands of people visit Ladakh these days but only a handful will bother going towards Zanskar Valley. And the ones who do are either rushing to Ladakh or returning from Ladakh and going home. On the way they will add a couple of days more to the itinerary and make a short trip to Zanskar Valley. There are two reasons that drive this behavior. The first one is that Zanskar is not really “on the way”. From Kargil, you will drive to Padum and then must return the same way all the back to Kargil. There is no way ahead yet that you can circuit on. Hopefully this will change once the road across Shinku La gets completed; connecting Padum in Zanskar to Jispa in Lahaul valley. After this road gets operational, you will then not have to travel back to Kargil and then just exit via Lahaul valley. Second reason is similarity in the landscape. Zanskar very much looks like Ladakh in terms of scenery so people tend to avoid it because they have already witnessed it all in Ladakh. In reality however, Zanskar is a hidden gem that definitely is worth visiting and spending some time in. 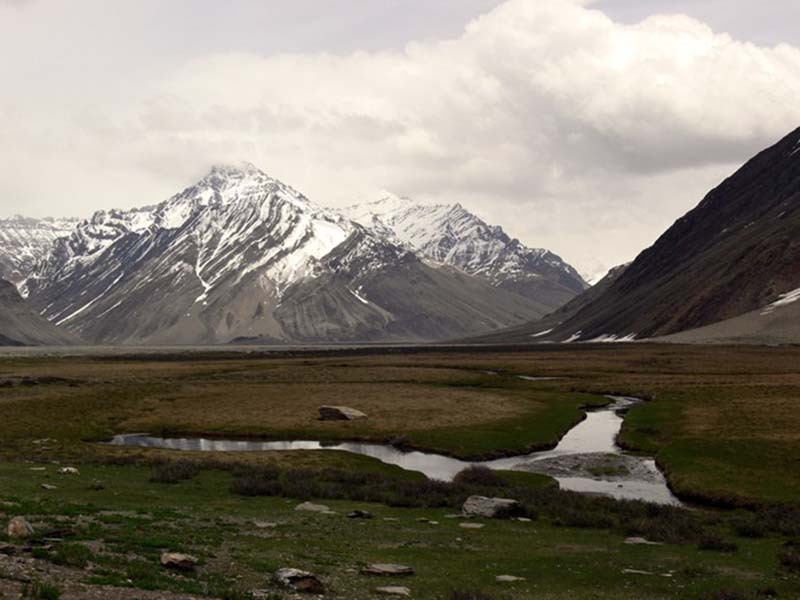 A trip here will take you across the valleys of Suru and Zanskar; and the slow transformation from the green of Suru to the barren brown of Zanskar will leave you spellbound. You must spend a couple of days in Padum and visit some of the local places like Zangla Fort and the beautiful monasteries here. Ladakh in recent times has started to get a bit crowded but Zanskar still remains a little unexplored and very well maintains its “offbeat: tag. This will work perfectly for someone who doesn’t like visiting crowded destinations and would rather spend some time away from people. Visiting Zanskar will not really cost you much really. If you were on a trip to Ladakh then adding a few days more of Zanskar valley will only mean adding of a few thousands. The only cost that may sting a bit and will be your largest expense is the transport cost; fuel if you were coming by your own vehicle and rental cost if you were hiring a private cab. This cost too however can be well reduced by choosing public transport which I will explain in detail in next part of this post. Accommodation in Zanskar will cost at about Rs. 500 per day on the minimum side at a budget guest house. There are several luxury stays as well here but for someone traveling on budget, you can easily find a hotel or guest house for Rs. 500 to Rs. 700. Depending on the total duration of the trip, you can multiply this cost by number of days you were traveling for; and you will get the total accommodation cost of your trip. In terms of meals, it is really a personal choice and will be different for each individual. Not only it will depend on what you eat but also how much you eat, LOL. There are however small eateries throughout the route where you can easily wrap up a meal for under Rs. 100 per person. To be on a safer side and for the purpose of calculating budget, I will suggest assuming Rs. 300 per day per person as your food expense. To explain the journey and related expense better, let me refer to an example of a Zanskar valley itinerary. For the sake of this article and the itinerary below, I will assume that you are starting your journey from Delhi. If you were however coming from a different city, then only the journey for first and last day will change. Rest of the details for rest of the days will still apply. This is really a very comprehensive and relaxed journey that will allow you sufficient time for sightseeing while ensuring that you do not travel too much on any given day. Long hours of journey are mostly limited to the days when you will travel from Delhi to Jammu and back. Depending on the number of days you have in hand, you can tweak this itinerary as per your plans. The itinerary above assumes that you only want to visit Zanskar valley and have no intention of covering Ladakh as well. If you were however on a trip to Ladakh and were incorporating Zanskar in it, then the details below will help you get a cost estimate of that as well. Following the itinerary above, below is how your hotel expense will look at places that you will be staying at. I am providing a minimum cost estimate but not also the bare minimum which may risk your budget completely. The cost below is what can be called a “budget trip” but also not so low that you may not find a hotel in this range at all depending on the time of your travel. As per the calculation above, at the end of 12 days, you will end up spending about Rs. 9000 for your hotel expenditure (round figure). If you were lucky and were able to find a cheaper hotel than this cost may even go down. If not, then assume Rs. 9000 as a minimum cost to be on a safer side. This however is the total cost and if you were traveling with a friend who was going to share the accommodation cost with you then per head expense will come down to Rs. 4,500. If you were planning for a lesser number of days, then just remove the cost of that particular day and place. I will recommend assuming Rs. 300 per day per person as your minimum meal cost. So for a total of 12 days, it will be Rs. 3,600 per person which you can round of to Rs. 4000. Your expenditure for hotels and meals then will be a total of Rs. 13,000 (Rs. 9000 + Rs. 4000). If you were sharing the room at the hotel with a friend then it would be Rs. 8,500 per person. Following the plan above, in a total of 12 days, you will be covering approximately 2,700 kilometers to and from Delhi; making fuel and transportation cost as your biggest expense for the trip. Below is your total distance chart. Your cost of transport here really will depend on how you were traveling. Let me run it down one by one. Let us assume 30 kilometers per liter as average fuel efficiency for your motorcycle. In city you may be getting a bit more but up in the hills, your vehicle’s mileage is bound to get affected because you will ride more in lower gears. At the time of writing this article, Rs. 71 is the petrol price in Delhi which I will use as the calculation cost. So 2700 kilometers at the rate of 30 kilometers per liter will mean total petrol consumption of 90 liters. Rs. 71 per liter for 90 liters means that your total petrol cost will come out to be Rs. 6390. So traveling by motorcycle then, hotel + meal + transport will cost you about Rs. 20,000 in total. I will assume 12 kilometers per liter as your car’s efficiency. Using the same calculation as above, if your car had a petrol run engine then your total fuel cost will be about Rs. 16,000. If you were in a Diesel run car, then this cost will be about Rs. 13,000 (using Rs. 60 per liter cost for Diesel in Delhi at the time of writing this article). You can add a total of Rs. 13000 for hotel and meals to this cost and you will get an approximate figure for your total expense. There are no self drive rentals available in either Srinagar or Ladakh so I am assuming that you are renting a car from your own city. Now there are two different costs that you will have to consider in here. First is of the fuel and then the daily rental charge. Cost of fuel will be the same as I explained above but the rental will really depend on who and where you were renting the car from. Whatever your daily rental is, multiply it by number of days of your trip; add the total fuel, hotel and meal cost and you will get your total cost. In terms of motorcycle as well, you will have to add up the total daily rental with your fuel expense. Your rental cost will depend on which motorcycle you were renting and from which city; but at an average, renting an Enfield; or any other 200CC or above engine bike; costs about Rs. 1200 minimum per day. So with that calculation, your total rental for 12 days will come out to be about Rs. 14,000. Adding it with fuel + hotel + meals and you are looking at a total of about Rs. 34,000 for 12 days. You could also be renting a motorcycle from Srinagar in which case, you can calculate the rental to and from Srinagar but will also then have to add your total flight or train charges you incurred to reach Srinagar. This cost will be divided in multiple parts. Since we are talking about a private taxi, I am assuming that you mean to rent it from Srinagar. So your first expense will be of catching a flight to Srinagar; which, if you booked tickets a couple of months in advance, will come out to be Rs. 6000 to Rs. 7000 per person, round trip. A taxi from Srinagar to Kargil and back will cost about Rs. 14000. From Kargil, you will have to rent another cab because your Srinagar one will not be allowed there. Cost however will be about the same. So from Kargil to Padum and then Padum to Kargil will cost you another Rs. 14000 approximately. Renting a taxi for sightseeing in Padum for 3 days will cost about Rs. 8000 to Rs. 9000. So in total, you are looking at a total cost of about Rs. 36,000 to 38,000 for private taxi for an 8 days trip to and from Srinagar. I hope the cost estimates above on visiting Zanskar Valley were of help. The transport cost I agree is kind of really huge here and it does not fall in the category of a budget trip. You can however travel by public transport and reduce this cost considerably which I will explain in next part of this article. If you have any other questions; or need any further details; please feel free to ask in the comments section below; or at our Community Forum; and I will be glad to answer.